Montaigne was one of the great humanists of the French Renaissance era and one of its most influential writers. He's best known for his essays, which not only made this literary genre more popular but also more interesting to the reader. Montaigne grew up speaking Latin and reading Vergil, Ovid, and Horace on his own. At age 6, he was sent to boarding school, the Collège de Guyenne in Bordeaux. He may have studied law, but the school is unknown; his father purchased a law office for him in the Court of Périgueux. He met Etienne de La Boétie, with whom he formed a lifelong friendship. Montaigne retired at age 37 to his father's castle to write. He later received numerous honors from the court of King Charles IX, including the Order of Saint-Michel, and was named a Gentleman of the Ordinary Chamber. He was elected mayor of Bordeaux and served two terms in office. Michel de Montaigne has a Legacy Library. Legacy libraries are the personal libraries of famous readers, entered by LibraryThing members from the Legacy Libraries group. » Michel de Montaigne's legacy profile. » Michel de Montaigne's profile. » Michel de Montaigne's catalog. Michel de Montaigne is currently considered a "single author." If one or more works are by a distinct, homonymous authors, go ahead and split the author. 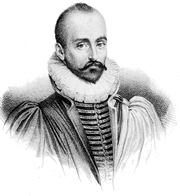 Michel de Montaigne is composed of 71 names. You can examine and separate out names.